American Dental Association statistics show only 12% of the population flosses regularly, mainly because floss is not convenient or easy to use. In today's busy world, people tend to forget about the all important floss. People are on the go all day and there is rarely time or a proper place to floss after meals...or maybe it just slips your mind. I've seen people use pens, paperclips, fingernails, staples, paper...and those can damage your sensitive gums! The BrytonPick is a new, convenient & discreet way to floss. The BrytonPick is designed to be used daily, on the go, to remove food debris and plaque from between your pearly whites. Use the BrytonPick after eating to cleanse the areas in between teeth, making sure to avoid contact with your lips. The cleaning edges may bend to adapt to your interdental shape. BrytonPick’s edges are too soft to be ‘pushed’ in between teeth. The round and blunt edges reduce the risk of injuring the gums, dental work and teeth. 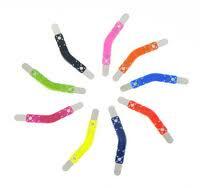 BrytonPick is strictly an interdental cleaner, it will not injure the gums since it is not forced into the gum line. Beginners risk: paper-cutting the lip. It may take some getting used to as the pick is a lot different than standard floss, but it's worth it. BrytonPick is even safe to use with braces! Storage is easy. Simply wipe off the BrytonPick with a napkin, tissue or hot water then store in the credit-card size carrying pouch. The BrytonPick is USA made from 100% recyclable materials. The pick is completely reusable as the cleaning strips are made of germ-resistant stainless steel. The pick was designed, developed and tested by dental professionals to make sure you have a quality product. *brytonpick via tomoson donated the product mentioned above for review. no monetary compensation was given and these opinions are my own.